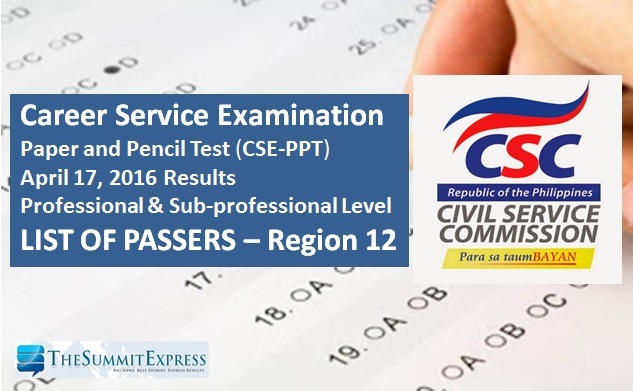 The Civil Service Commission(CSC) officially announced the results of April 17, 2016 Civil Service Exam - Paper and Pencil Test (CSE-PPT) known as the career service exam for Region 12 (Soccsksargen). A total of 771 examinees passed the professional level tests in Region 12 according to CSC. Below is the full list of successful examinees for Region 12 (Sarangani, South Cotabato, Sultan Kudarat) civil service exam (CSE-PPT) professional level.